Orbis Sensualium Pictus - English and Latin Audio Book. John Amos Comenius composed his "Orbis Sensualium Pictus" (The Visible World in Pictures) as a first primer and introductory schoolbook. He believed the teacher should use visual aids, and, where possible, actual physical models. The curriculum should be wide ranging, and cover all the main areas of everyday life as it was experienced by his students. He does not sanitize the harshness of the world. Thus all the items mentioned in the text are referenced with numbers to engravings, that are positioned alongside the text. His young students would find out about the world, and all the main ideas that people had about it, in a simplified form - astronomy, climatology, zoology, botany, human anatomy, philosophy, geography, geometry, musical instruments, warfare, politics, jurisprudence -a student studying this book will accomplish two things - they will build up a vocabulary of a few thousand Latin words, acquire a knowledge of simple grammatical structures ( the sentences are all relatively simple) and in addition, gain an insight into the world, as it was understood by a Protestant Renaissance scholar in the mid 1600's. The Orbis Pictus is recorded carefully in restored Classical Pronunciation, chapter by chapter, and the pdf of the edition used is included on the DVD. This text, despite its advanced age, is still suitable for use by young students. The text used here is the first American edition of 1810. This textbook is one of the most famous pedagogical texts ever written. Comenius' Orbis Sensualium Pictus was also the first ever illustrated children's book - and as such, occupies a unique and important place in the history of education.A small amount of this material is on the podcast, however the complete reading of the text, with each phrase read twice in Latin and once in English, is only available on this DVD. The Rosetta Stone is one of those seminal texts - something we have all read about, and recognise the importance of - but how many have ever read it, or know anything about the contents of it? This short reading (around 17 minutes long) presents Heyne's translation of the Greek text of the inscription, read in restored Classical Latin by Evan Millner. Nutting's "De America". This interesting series of historical stories ( broken into 100 episodes) is composed in relatively simple Latin. It chronicles the period from Christopher Columbus until the founding of the American Republic. Conceived of as a reader introductory to Caesar, the series focuses on the period of discovery, and then on battles between the settlers and the Native Americans, and between the American colonists and the British, interspersed with individual tales of the trials of life during this interesting period of history. Occasional discursions are made when a comparison with Roman history seems apt. This is not a dry re-telling of history, but is a carefully crafted and delightful series of stories, that are well enough written that they bear listening to several times. One of the best Latin readers I have yet encountered. Read in the restored classical pronunciation of Latin by Evan Millner. Recorded in November MMIX. This traditional Latin textbook, dating from the very early 20th Century, was produced in audio in November 2009. Many students still enjoy using it, and it is popular with people studying Latin at home. My view is that it is useful to use a variety of textbooks; not every author explains every point the same way. Also, reading or listening to a variety of explanations of the same points is good, and increases the chance of learning the material thoroughly. D'Ooge uses more formal grammatical terminology than either Underwood or Adler. His method is known as 'grammar-translation'. This audio course adds a third dimension to his textbook, turning it into a comprehensible input source as well. D'Ooge's textbook also comes with a mini Latin reader with a graded selection of prose in basic Latin. The pdf that the audio was produced from is provided for your convenience. Swallow the Dictionary? Now you can. Over 100 years ago, Walter Ripman, in his 'Handbook of the Latin Language', organized Latin vocabulary into domains and subdomains. The noted New Testament scholar I. Howard Marshall, himself a student of Latin, claims that Ripman's reference was "an extremely useful way of organizing the material for a student learning Latin vocabulary." This DVD has 50 semantic fields, with sub-fields. It closely follows the pioneering work of Ripman. Each word is read in English and Latin, so correct quantity is learned naturally. Tens of thousands of words are presented - this DVD is intended to be listened to multiple times - initially this will be quite tiring, if not bewildering - however, this system will help to build your vocabulary rapidly, and, if refreshed on a monthly basis, the words you have learned will become consolidated, and new words and idiomatic expressions will become engraved in your mind with each subsequent iteration. Now available in audio from Latinum.The digital download includes some additional experimental revision audio files in Latin only - you might want to put these in a separate folder after download. depending on user feedback, I will provide more of these in future releases of this item. 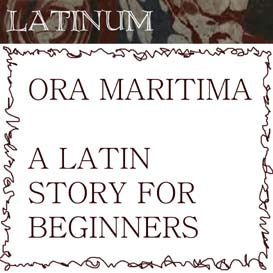 Ora Maritima - A Latin Story for Beginners. 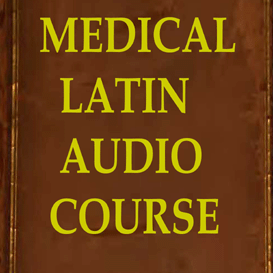 Latinum's issue in audio in November 2009 of Underwood's course in Latin for Medical Students is a unique offering. Underwood wrote his course for medical students taking the Latin examinations at London's Guild of Apothecaries and the Royal College of Physicians in the early 1800's. These students, as non-Latin specialists, required a common-sense approach. The result is a very accessible beginner's Latin course. It would also be useful as a revision course for the more seasoned student, as it approaches the subject from a fresh angle. I am very fond of this course - it is very well constructed - traditional in its approach, but, Underwood has a rare knack for being able to explain matters with great clarity. Underwood wrote his course for the home school student - but advises of the need to find a Latin teacher who can teach pronunciation - the audio course supplies this requisite. As the vocabulary and examples are drawn from Latin medical and chemical texts, much of this material will be somewhat familiar to the prospective student. This reduces the apparent strangeness of the language, and makes the course more accessible to a non specialist wishing to learn Latin. Needless to say, the course here outlined should be of great value to a student of medicine or pharmacology. Latinum's audio course covers the entire grammar as laid out by Underwood, and the Latin syntax. Underwood, in his introduction, makes a very important observation; it is, he says, vitally important to read - so get your hands on an interlinear text, and start to read, or listen to bilingual Latin texts provided by Latinum for this purpose - for we are thoroughly in agreement with Mr Underwood with regard to this point: a large volume of reading is an absolute necessity if certain progress is to be made in the aquisition of the language. 2. Various exercises in building sentences. The pagination of the book reverts to page one half way through.